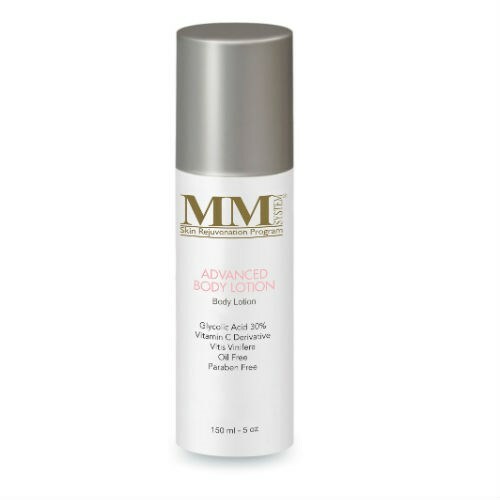 Mene & Moy Advanced C Body lotion works to effectively combat sagging skin and refine uneven texture. It is particularly ideal for use on breasts, stomach, buttocks, arms and legs. Your skin rapidly becomes smoother and firmer. This 150ml body moisturising lotion helps treat thick, inelastic, aged, stretched and sun-damaged dry, irregularly pigmented skin. It is recommended to begin with Revitalising lotion and work up to Advanced C.
Water (Aqua), Glycolic Acid, Ammonium Hydroxide, Ascorbyl Methyl, Silanol Pectinate, Hydroxyethylcellulose, Propylen Glycol, Isoceteth-3 Acetate, Glyceryl Stearate, Magnesium Aluminum Silicate, Sorbitan Stearate, Stearyl Alcohol, Celeareth-20, Stearamidopropyl Dimethylamine, Polysorbate 80, PEG-40 Stearate, Lanolin Alcohol, Grape (Vitis Vinifera) Seed Extract, Cholesterol, Demethicone, Fragrance, Tetrasodium EDTA. Apply once a day at the start of treatment, then twice a day, if well-tolerated, to reinforce results to twice a day. It is recommended to begin with Revitalising lotion and work up to Advanced C.